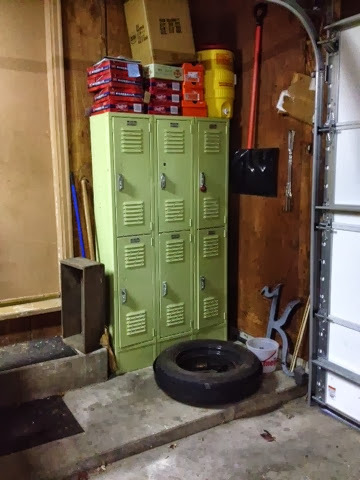 I have been feeling a certain urgency about our garage lately. 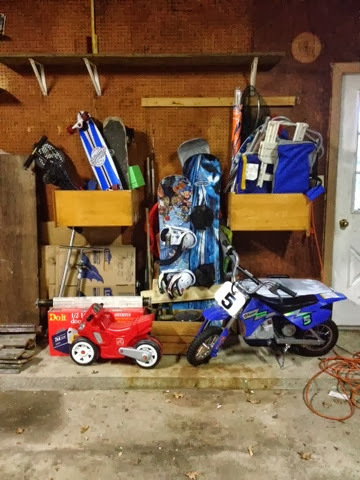 I'm not sure if it's because I know winter is right around the corner and I would LOVE to be able to park inside the garage. But I felt the need to organize and clean. We have lots of small things that don't really have a place. So I knew that was first on the list. 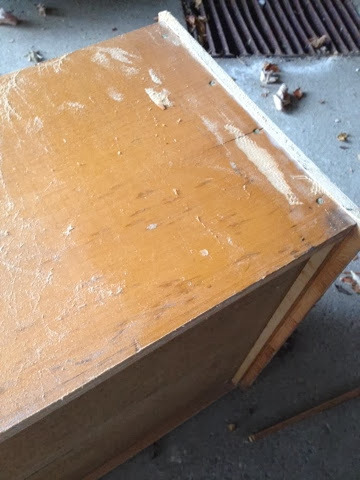 I found a couple of big drawers from the old kitchen we ripped out of our house. Sometimes I hang on to stuff because I think the item has potential. This either comes in handy or is a huge waste of space. In this case it paid off. I was wanting to cover a lot of ground without a whole lot of time. So I decided to leave the drawer just how it was and screw it into the wall. I had to make one minor adjustment before doing that. The face of the drawer came out a little and so it wouldn't sit flush against the wall. 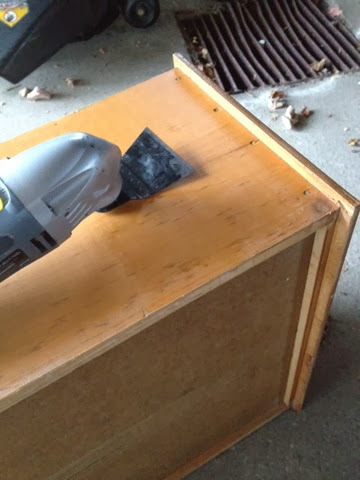 I took my handy dandy power tool and slid it along the edge. I took about six or seven screws and tried to make sure I hit a stud at some point. 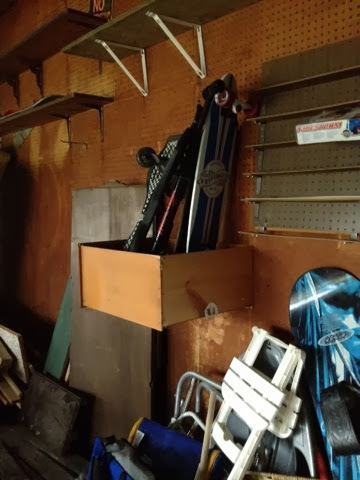 Now all those skateboards and rip sticks have a home besides laying on the floor of the garage. That ridiculously flimsy and narrow shelf next to my new shelf served no purpose for us so it had to come down. 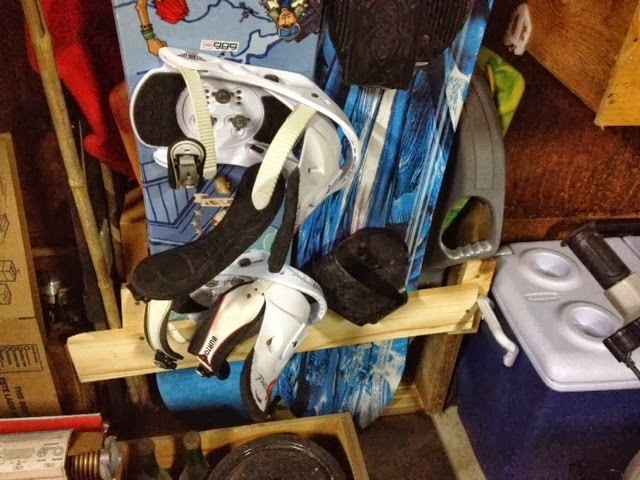 In its place I rigged up a corral for our sleds and snowboards and fishing poles. It started as a wood shelf that originally sat in the bottom of a bedroom closet when we first moved in. 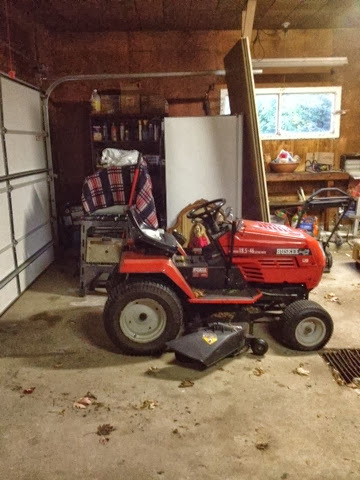 It made its way out to the garage where it sat. 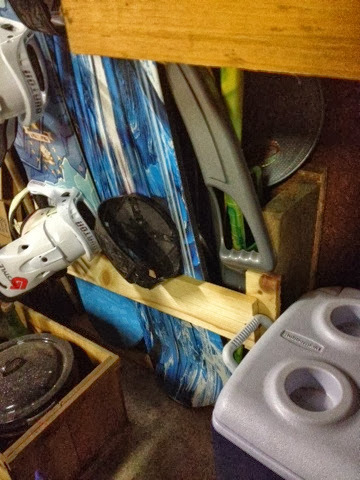 I screwed a board on the bottom (although this wasn't necessary since I decided to use it against the floor) and then screwed a board in place along the front. I then screwed it into the wall so that it wouldn't topple forward. It's hard to see it. 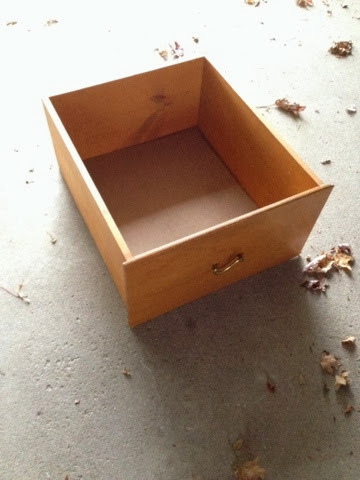 As you can see from the picture I screwed into place the other drawer I found. This is holding all our summer/beach items. It feels so good to have it organized. 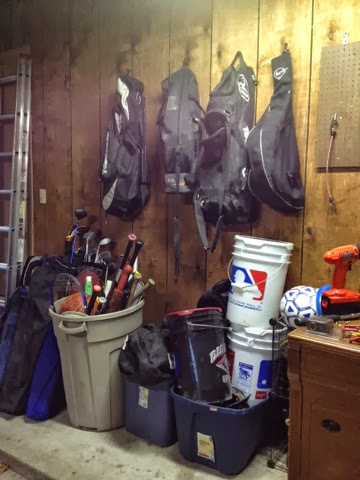 I also added nails to hang up all the baseball bags. 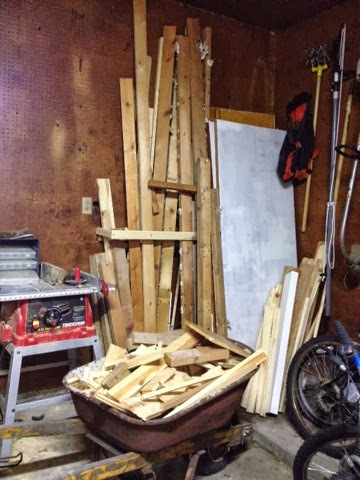 And I tried to build some sort of holding box for all the wood we have. It didn't turn out so well. 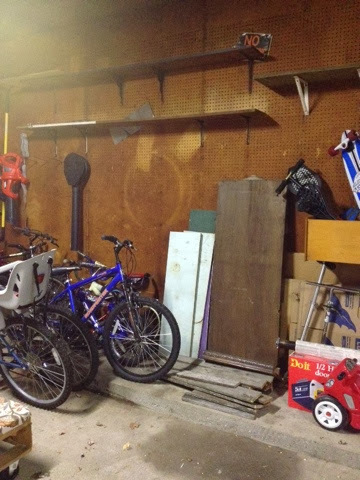 I'd like to take down these shelves (because 8ft up is so convenient) and add hooks to hang bikes in the winter time. 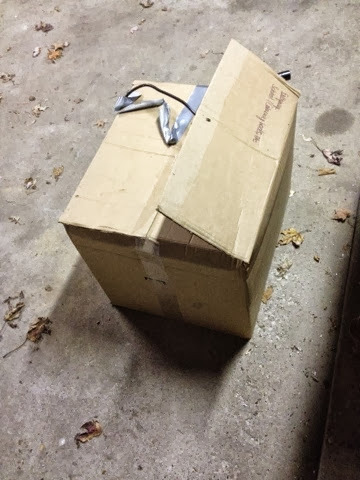 I have one more box still lurking around the garage from our move. I'm getting to it this week! And here are our lockers right next to the door as you come in the house. One problem though- a certain child cannot remember the combination of a lock that is on his locker since it's been over a year. 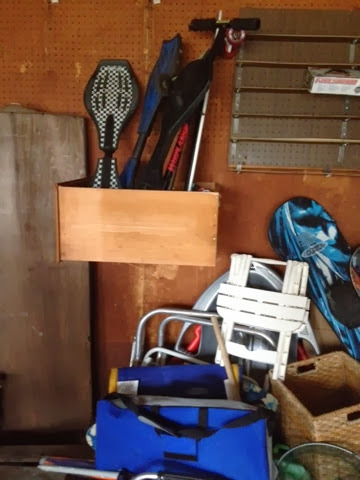 There are still some loose ends to tie up but for the most part out garage is organized. Now if only we could get our oven into the house and the old fridge fixed and sold!